This is a great bowl for when you are in the mood for something that feels fresh and light but is actually super-nourishing and will keep your energy levels up during your busiest days. Sunchokes are a great detoxifier because of the strong presence of inulin, a soluble fiber that binds to toxins to help eliminate them. Cucumbers are hydrating and further help to reduce toxins, while radishes are anti-inflammatory and help to prevent cardiovascular disease. The colorful beauty of bright pink watermelon radishes will also help to lift your spirits on a dreary winter day. It’s like a little spa in a bowl. Works for me, anyway! 2. Bring water to a boil, add rye berries, reduce heat, cover and simmer for 1 hour or until tender. Drain and set aside. 3. In the meantime, toss sunchokes in 2 tablespoons olive oil. Season with kosher salt and black pepper to taste. Spread out on a sheet pan in a single layer and roast until golden brown and tender. 4. Toss brussels sprouts in remaining 2 tablespoons olive oil. Season with kosher salt and black pepper to taste. Spread out on a sheet pan in a single layer and roast until golden brown and tender. 5. 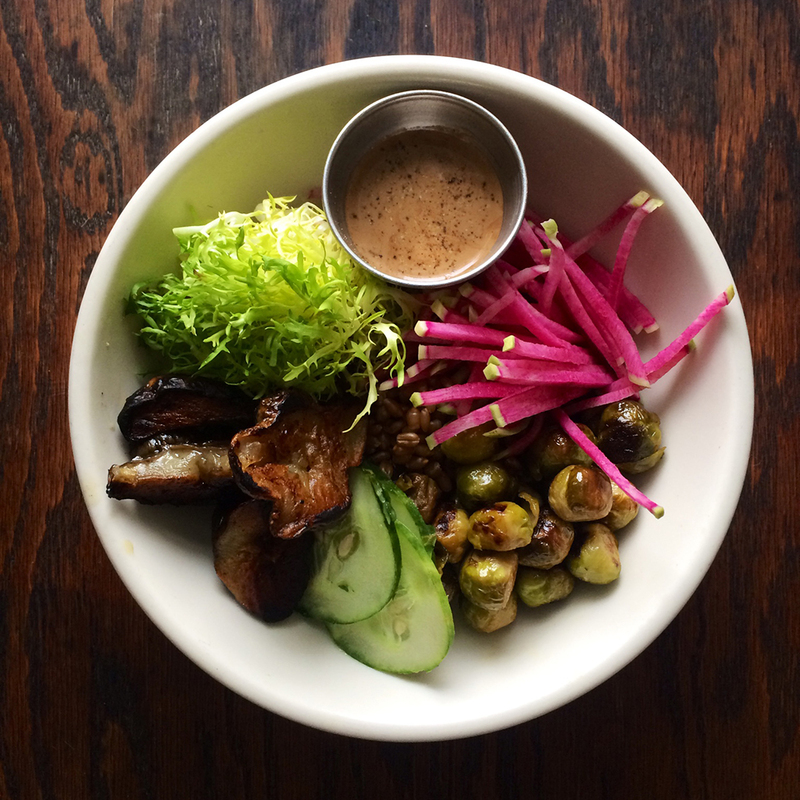 To serve, divide rye berries, sunchokes, brussels sprouts, frisée, radishes, and cucumber between each plate. Drizzle with rosemary-date vinaigrette to taste. 1. Place balsamic vinegar, Dijon mustard, garlic, rosemary, sage and dates into a blender. Blend until very smooth. 2. With the motor running, add oil in a very slow, steady stream to emulsify. 3. Season with kosher salt and black pepper to taste.